A 380 square foot home built for "Tiny House Nation." 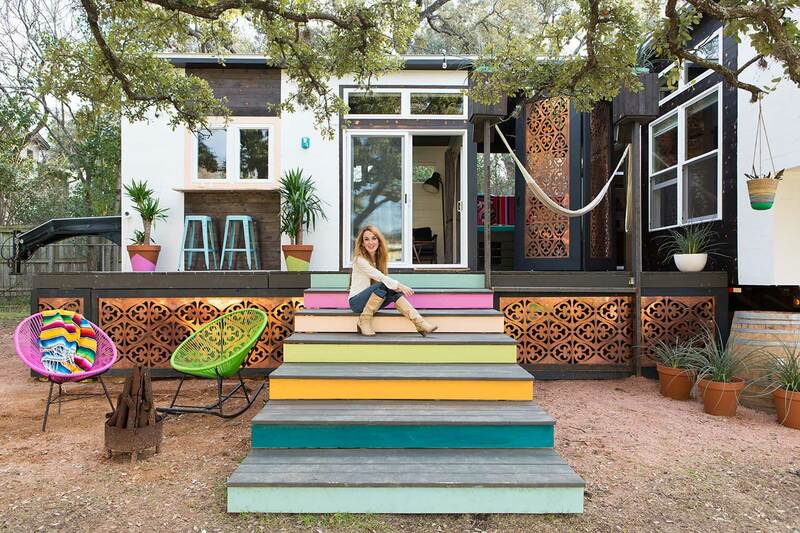 LOS ANGELES - Kim Lewis, former designer for ABC's "Extreme Makeover: Home Edition" and FYI's "Tiny House Nation" will launch her own line of Tiny Homes at Dwell on Design, June 23-25, Los Angeles Convention Center. Attendees will be able to see "Joshua Tree" style tiny home for the "Desert Dweller" at Kim Lewis Tiny Homes booth #2446. The home features a two-trailer design, with separate Living and Bedroom units, totaling 560 square feet. An open floor plan blends indoor and outdoor living for the adventurous soul. The color palette is inspired by earth tones and the peaceful vibes of a colorful sunset reflecting across a desert landscape with saguaros and mountaintops in the distance. Lewis spent six years as one of Extreme Makeover: Home Edition lead designers. According her web site, Lewis has designed over 120 homes in 43 states and work has been featured on ABC, HGTV, TLC, National Geographic, Spike TV, Animal Planet, and FYI's "Tiny House Nation".